In May 1862, Gen. George McClellan’s Union army was poised on the outskirts of Richmond threatening the Confederate capital. Here, in the Dabbs House, Robert E. Lee, as new commander of the Army of Northern Virginia, opened his headquarters on June 1, 1862. Four days later, he had shaped the strategy that would free Richmond from the Army of the Potomac. Two notable conferences occurred here. The first, on June 11, brought cavalryman Gen. J.E.B.Stuart to plan with Lee the famous ride around the Union Army. That feat, which covered 100 miles in 72 hours, electrified stagnant morale among citizens and soldiers alike and was the first flash in Stuart’s meteoric career. Almost two weeks later, on June 23, Lee assembled his top subordinates for the first time. Using information gathered from Stuart’s ride, he unveiled his plan to drive the Northern army away from Richmond. 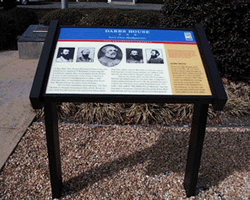 This event, often called “The Dabbs House Meeting,” was the first step in the series of battles known as the Seven Days that introduced Lee to the world as a talented general.